Few things are better than a summer barbeque with friends and family, complete with sunshine, great food and some silly garden activities to bring people together. But if your budget doesn't stretch to A List entertainers (and let's face it, whose does?) then the good news is that there are some great ways to have fun with your guests without having to break the bank. For a bit of extra help with your budgeting, here are four great barbecue party games you can play for next to nothing. In the summer heat, water-based games are always a winner. Fill up some balloons with tap water and create a series of targets around the garden or back yard using a pen and paper, a marker pen or some string. If you really want to go all out, you could make it into a course for the guests to follow, with different targets earning different points. There's always the chance that this will descend into a full-on water fight, but hey, at least you'll have made a splash. Using a pack of a cards, assign each card a rule or party game. The best ones for this are silly word games, like Two Word Tango, Categories or Rhyme. In Two Word Tango, the first person says the name of a celebrity (Tom Cruise) and the next person names a celebrity whose name begins with the same initial as the surname of the first (Cheryl Cole). Categories is about naming as many things in a given category as possible (i.e. pets or English cities), and Rhyme is exactly what it says on the tin, going round in a circle saying a word which rhymes with the one before it. You can also use some classics like Pictionary and charades for this, as well. Going round in a circle, have each guest pick a card and then start off the game assigned to that card. 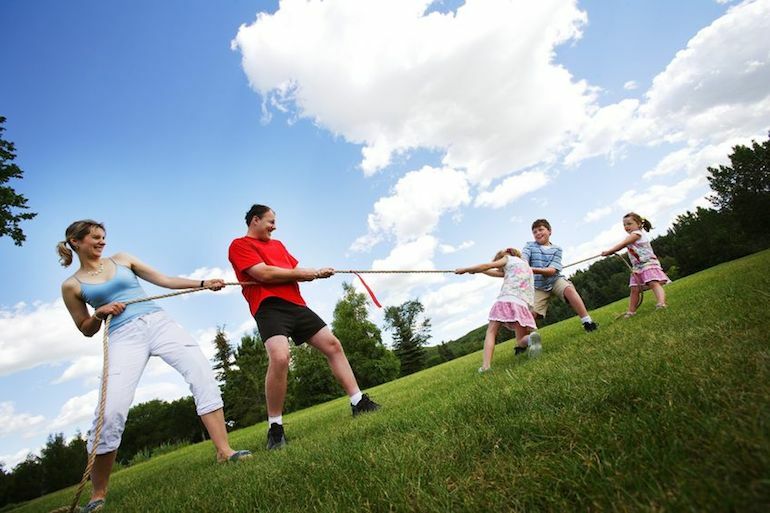 A hit with adults and kids alike, tug of war is a true classic. Simply tie some old sheets together and let the battle of the brawn commence! If you've got balloons coming out of your ears, it's easy to blow up a few to use for a classic group party game. Split the party into two teams, who then stand in a row with a balloon on each side. The person at the end of each row places the balloon (or egg) between their knees. When the referee shouts Go! each team tries to pass the balloon down the line using only their legs. If anyone drops it, it goes back to the start of the line and the team starts over again. Whichever team gets their egg to the end of the row first is the winner  and they get first dibs on the hot dogs! If you're planning a fun-packed summer barbecue on a budget, don't forget to track your savings and expenditure with our free budgeting software. With Money Dashboard, you can get a comprehensive overview of several accounts at once and track expenses and sources of income throughout the month, so you know exactly how much you can afford to splash out on fun and games at your barbecue bash.